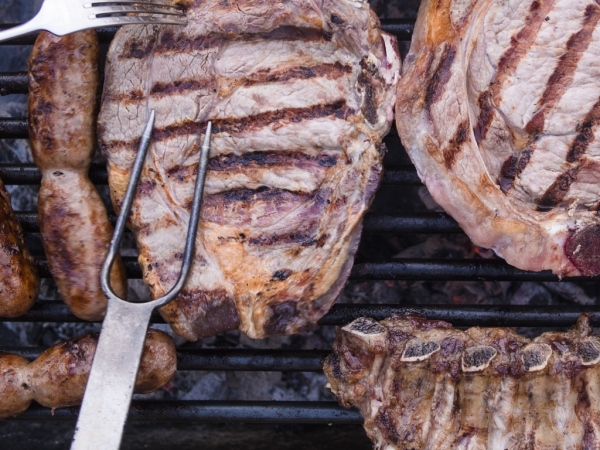 Tucking into a juicy steak is many people's idea of a weekly treat, but new research suggests doing so could dramatically increase your bowel cancer risk. Scientists have claimed that those who consume four portions of red meat a week, which is less than a 10oz. steak, see their chance of developing the disease shoot up by 42 per cent. Having two portions a week has been linked to an increased risk too. Last week the World Health Organisation issued a stark warning about how dangerous processed meats can be, suggesting those whose diets are rich in them are more likely to develop cancer. The new study is one of the biggest of its kind and appears to back this up, with 500,000 middle-aged men and women involved. Each had completed a questionnaire, detailing their meat intake, and they were tracked between 2006 and 2010. During those four years 1,503 developed bowel cancer, and it was discovered that people who consumed red or processed meat four times a week were 42 per cent more likely to get the disease than those who either didn't have any or ate it only once a week. Even people who only had it twice a week saw their risk level increase by 18 per cent when compared to vegetarians. A portion is considered to be 70g, which equates to two rashers of bacon or one sausage. To give an idea, a quarter pounder burger is 200g, while a 10oz. steak is 284g. "People need to be aware of the risks and make modest changes if necessary," Professor Tim Key of Oxford University said. "Eating things other than meat seems to be the sensible approach. So eating plant-based proteins, such as beans, chicken or fish." The findings are to be presented at the National Cancer Research Institute conference, held in Liverpool, on Tuesday. The research will be continued with a further 200,000 people questioned. In part this is because the first group didn't discuss how large their meat portions were, so this time around that will be detailed.